Chesapeake Pebbles 2pc. Bath Rug Set (21"x34" & 24"x40") - 21"x34"/24"x40"
Chesapeake Pebbles Bath Rug Runner (24" x 60") - 24" x 60"
Chesapeake Davenport 2 pc. Bath Rug Set (21"x34" & 24"x40") - 21"x34"/24"x40"
Chesapeake Boulder 2 pc. Bath Rug Set (21"x34" & 24"x40") - 21"x34"/24"x40"
A Plush Pebble Pattern Bath Rug to add the feel of relaxation to your bathroom. Brings the coolness of hues into your bathroom. The light, dark and white colours of this bath rug set will surely be a welcome addition to your bath decor. The colors are made perfect by the pebble shapes of the design against white. Our Pebbles collection features fun and eye-catching designs and beautifully contrasted color combinations. This particular set was designed to bring a neutral and slightly warm tone into your bathroom color scheme. We have 5 beautiful color combinations to match your bathroom décor. When you're seeking beige bath rugs that will bring soothing warmth and cool comfort to your bathroom, these are a great choice. The 2 piece set includes a 21"x 34" and 24"x 40"rug. These bath rugs are spun of 100% Cotton. Machine-tufted with a lightly sprayed anti-skid back. Dimensions 40.0 In. X 24.0 In. X 0.5 In. These are great mats, great quality, however, they are not the color shown online. I orded the spa color which looks like light blue. They are a very light sea green. My bathroom is accented in light blue/green which actually works ok with these mats. The light blue would have been better, but these will work. They also don't have nearly as much of the sea green color. Much more of the earth tones in the mats. More of the accent color would have been nice. Great mats, just not exact color shown. Don't wash it too much! I bought the brown pebble mats for my bathroom. Pros: Looks nice; is neutral enough to go with almost every color of towels at home! Cons: Washing them, lots of fuzz, pieces of the "yarn" came off in the washer, even on the hand wash cycle. I dried in the delicate cycle and the lint trap was just full! The backing is not too sticky after one washing - and it tends to slide on my tile flooring in front of the sink. Unique rugs for a fair price. I bought the Spa color and it was very similar if not exact to the picture. The colors are tans, dark brown, off white and light gray. Another review mentioned the" blue" being more of a mint or light "green". There is no blue or green in my Spa rugs. The color the other reviewer was referring to must have been the light gray. The colors in this rug are natural looking neutrals. 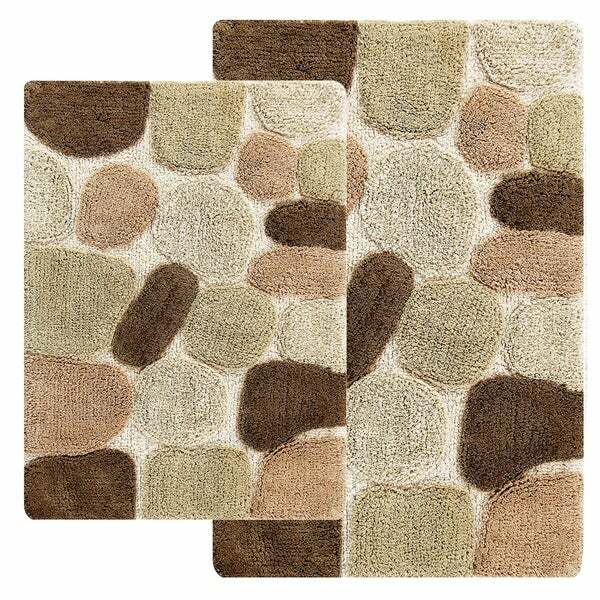 This Rockway Pebbles Cotton 2-piece Bath Rug Set with BONUS step out mat was a great purchase. The set is beautiful and looks great in the bathroom. Bought these for display. After a while, decided to wash them. Unbelievable! They shed so much in the washer, it clogged the pump up. My husband had to take the washing machine apart and remove the fibers from the pump. Why can't we buy anything any more that has any quality? Please do not waste your time and money on these! This set of bath rugs is beautiful. True, the color is not as vibrant as you would think or as shown on the screen, and I was a little hesitant due to the previous reviews. However, these are definitely worth the money and more. The are the highlite of my bathroom and you can decorate everything else around them. They are on the thin side, but easy to wash and a very handsome addition to any bath decor. The size is also bigger than I expected and fell flat on the bathroom floor without any problems. Enjoy! Great with a nature themed bathroom! I bought the khaki set, and I love them! They went very well in my bathroom with my tree-outline shower curtain. However I must not have carefully read the details, (or maybe it didn't say I honestly don't remember) but there is no rubber tread on the back of these so they move around a little bit. They do have a textured back that prevents most slipping though. When I first got this rug I was concerned about the uneven tufting on the rugs. After a day I never even noticed that. I use one beside the sink and vanity and one on the step and ground of my walk in shower. I have not had them long, but they are holding up well to foot traffic and shower dampness. I purchased the Khaki color and it really has some nice rosy brown shades that look great with the marble and tile in the bathroom. The step out mat is small but cute; I hung in in the spare bathroom just to have a "finished" look there. The mat does not have rubberized backing like the larger rugs, so I don't want to use it on my slippery floors. I am planning to buy another set (the spa color) for my ocean themed bathroom. These rugs are really different and cool. I love the pattern on them and they are really soft. However the 2 'new willow' rugs I recieved shedded lint/cotton tufts to an extent I have never experienced before. It took 4 washes before the rug didn't leave lint on my feet after I stepped out of the shower! It's a small miracle that all the loose cotton didn't clog the water pump in my washer. Don't forget to clean the lint trap after you dry them too. Thye product color and design were perfect for my bathroom. What I didn't realize and what was not emphsized hen I read the specs. was that the rugds were NOT with a non-skid backing. I am 83 years old and safety is a very important consideration when I purchase items of this nature. The product is fine for most people, but in my case it is not Sorry folks. The items are as described. I can feel the rock-stone like texture when I stand on the rug. The rug itself is non-skid and thick. These rugs look really neat, they are unique! The quality isn't the greatest though, the seams on the edge are very uneven which makes them look cheap. If there is any non-skid attribute to this rug set, it seems to be completely missing on the set I received. It slides all over the place, bunches up, doesn't stay flat, etc. The sculpted design also means the surface is not flat. This can be an issue for anyone with problems walking on non-level surfaces. I am washing them for the first time and they are now in the dryer. When I took them out of the washer, I couldn't believe the amount of shedding that had already occurred. I suspect they will not dry very nicely and will be matted and no longer completely fluffy. Another disappointment was the color. The photo gave me the impression that there was more of a distinct difference between the colors of the "stones", but it is very blah. This set is not worth the price. Find something else. Product colors were not as shown in photos. Wash up beautiful and look like new again. Order more colors to change out my kitchen. They do not slip and slide on our vinyl flooring in the kitchen. Very comfortable and soft. The large rug looks beautiful in the master bathroom and the smaller rug fits perfectly in the half bathroom. We ordered this in the gray color scheme. The gray is very neutral and doesn't skew too blue or too brown. The texture is nice, and the pebbles are higher than the white part in between them. The gray is what I bought. Exactly the look I wanted! Very nice! Made my bathroom look very elegant and the feel on my feet felt like walking on cotton. The rug looks great. Kind of cute since I have the same color pebbles on my shower floor. HOWEVER, the product is covered with a non-skid spray. The rug is washable (wash on gentle cycle by itself! ), but the coating melts off in the dryer! Even though the instructions say it can be dried, DO NOT PUT IT IN THE DRYER! I spent over half an hour cleaning the residue out the dryer! It's kind of sticky and left a pretty good coating on the dryer walls but a good spray cleaner will get it out. I didn't see any residue in the washing machine. Thin, but looks and feels good. Holding up well with 5 people using in the bathroom daily, washed and hung dry, so far no pilling or problems with quality. "Since the pictures are not labeled with the names ie: spa —-which one is it? I am interested in the tan, grey, and white color scheme which one should I pick? " The third picture from right to left is the spa option. Tan,gray and white. "Another reviewer stated that the step out mat is a different design. What will it look like and what color will it be?" I purchased the spa color and the step out mat is "bottle green" which really doesn't match the colors in the other mats but I don't use it so I don't really care much. The colors match in the two mats, not matching would have been send back for me. The sizes are appropriate as well for the vanity (step out) and large one for the long bath tub. The home run was that the coordination with the shower curtain could not have been better if I had been in person. Just was blessed on this purchase.. I got a very small, light green oval shaped rug. It's not meant to match the rugs you're buying, just a freebie. The rug is unique and it has a tranquil and relaxing look. "Is the color gray or light blue in the spa colored set?" Hi Lucy's mom, thank you for your inquiry! This rug appears to be grey. We try to represent the colors of our products accurately. Unfortunately, due to the difference in monitor colors we cannot guarantee that the color will match exactly what you see on your screen. "I'm not seeing the size of these 2 rugs . . . ."
Hello jakuehl, the dimensions for the smaller sized rug are 21 inches high x 34 inches wide and the dimensions for the larger rug are 24 inches high x 40 inches wide. We hope this information is helpful. Thank you for shopping with us and have a wonderful day! 40" x 24" and 35" x 21"
"I would like to know when Spa color will be back in stock. Is there a way that I can be informed?" Hello amyklibonoff, products are stocked as they become available. We cannot guarantee when a product will be restocked. Please check back with us periodically to see if it has been restocked. Thank you for shopping with us. good luck with that ... seems this pattern with the spa color is hard to find - it is not only offered here. "How high is the rug. I have a door it has to gounder"
Hello chaleff, this is 1/4 inches thick. Thank you for shopping with us. The circles are raised however my door opens freely. Tan Pebble Beach Bath Rug (30"x50") - 2'6" x 4'2"